Members who wait to collect Social Security receive a larger lifetime payout. By Genworth Financial Home Equity Access, Inc. Using a Reverse Mortgage loan to defer claiming Social Security benefits can be a smart way to gain more retirement income for your members. You’ve seen the statistics — an ever increasing number of retirees don’t have enough saved to fund their retirement years. As Americans live longer, even the most diligent retirement savers might find themselves outliving their retirement savings. According to US News, approximately one out of four 65-year-olds today will live past age 90. Although Social Security provides a safe, stable source of income, most retirees start their Social Security benefits the earliest they can — at age 62. You can help members who have equity in their homes consider deferring Social Security by showing them how a reverse mortgage may be used to cover expenses while the Social Security benefit grows. 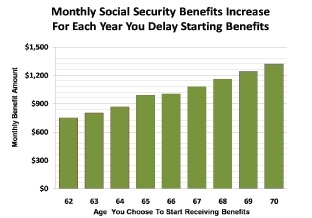 According to the chart below, a member who starts collecting Social Security benefit at 62 would receive only $750 for the rest of their life (monthly amounts also subject to Cost of Living Allowance increases). According to the Social Security Administration, if the member waited to receive Social Security until age 70, their monthly benefit would start at $1,320 — almost double the early retirement benefit. Based on current life expectancies, deferring Social Security benefits will increase the lifetime value of a member’s Social Security benefits. Funding retirement during the deferral period — an eight-year period reflected in the chart — is where the reverse mortgage comes in, providing a source of supplemental cash flow. Because reverse mortgage loan proceeds are not taxed, the net amount of monthly cash required typically is less than what is needed from Social Security. Also, there might be additional tax benefits when accrued mortgage interest is paid. Genworth Financial, Inc. recommends members consult with a qualified tax professional who may be able to offer more detailed information regarding tax benefits. Help members discover how home equity can work in concert with other retirement assets to enrich their entire portfolios. To learn more about the services Genworth Financial offers in exploring reverse mortgage opportunities, please contact either Tom Werder at Tom.Werder@genworth.com or 916.384.1874 or Robert Scott at Robert.Scott@genworth.com and at 916.384.1902.